As far as I'm concerned, the most scenic drive in all of North America is just north of Vancouver near a town called Squamish. The views along the Sea to Sky Highway which leads to the town winds along the Pacific Ocean with stunning views all along of Howe Sound. 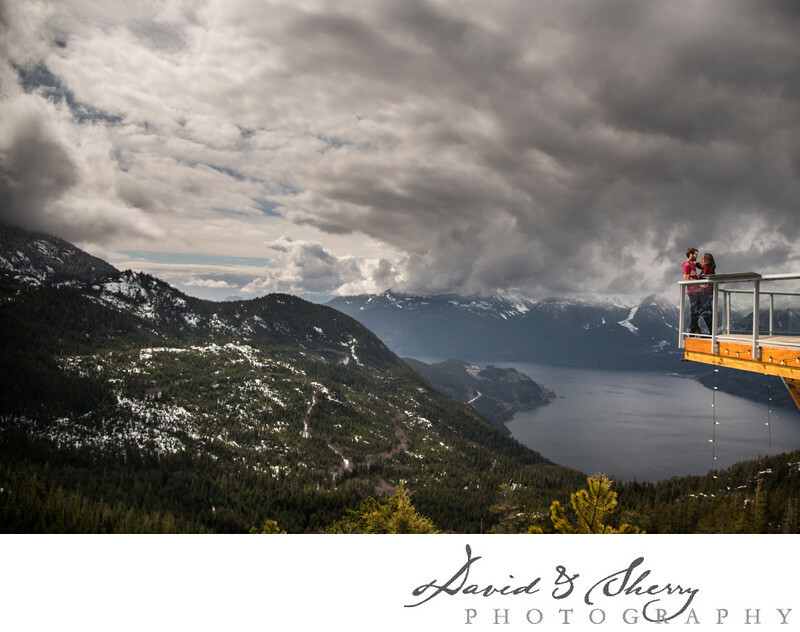 Right beside a picturesque mountain called Stawamus Chief is the Sea to Sky Gondola. This fantastic tourist attraction is the perfect place to have your wedding or pre-wedding photos taken in the mountains of B.C. We headed up the hill with Kyle & Aleah on their pre-wedding engagement photo session and hiked all around the trails up top making our way to the most beautiful vantage points to take advantage of this perfect spot. One of the lookouts they have built takes you over the cliff to view the ocean and mountains. We framed a beautiful photo of the couple silhouetted and high lit by the sun against the dark mountain side. The main building at the peak has a long suspension bridge which hangs over a deep canyon and connects the walking path to another lookout. We made our way across the bridge and stopped in the middle even though the fear of heights loomed large. 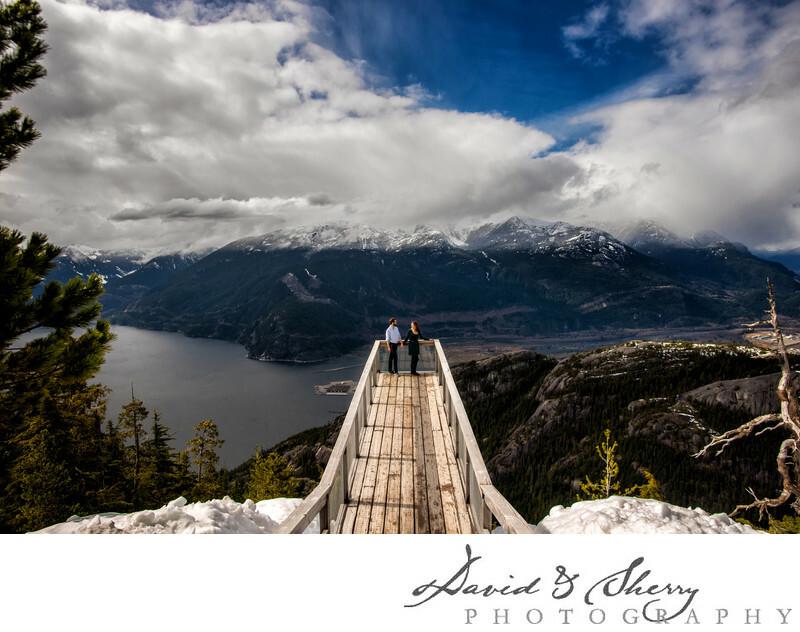 As photographers we are always looking for different ways to photograph what has been captured many times before and in this case we used a 105mm f/1.4 lens to capture a 32 image panorama of the scene with our couple in the middle of the bridge overlooking the mountainous landscape in the background. This allows us to capture a narrow depth of field, creating beautiful bokeh in a wide landscape style picture. The effect is called the Breziner effect and when done well the results speak for themselves. This image now hangs as a 7ft canvas above their bed in the client's bedroom which is the purpose of creating these beautiful couplescapes for our clients. Location: 3680 BC-99, Squamish, B.C. V0N 3G0.